Corn is contentious. Not the sweetcorn that we eat – and the only corn crop grown in the UK – but the corn that has infiltrated our lives in some very non-food and non-nutritious ways. In the US, where it is by far the most-grown and most renumerative crop, field corn is used in manners various and sundry: as fuel in the form of ethanol; to hold food as plastic bags, plastic spoons and forks; to fatten livestock and thicken food. Because it is less sweet, field corn is also used to make tortilla chips and cornmeal. Its sugars are also used to sweeten food, namely the ubiquitous, liver-damaging, high-fructose corn syrup. Plus, eighty-five per cent of field corn in the US is genetically modified, often without product labels to tell you so. Contrast that with less than five per cent for sweetcorn, but that number is increasing. Thanks a lot, Mon-flipping-santo. Although it is one of the least sprayed crops, if I still lived in the US I would be tempted to go organic with this one just to be sure it wasn’t genetically modified. This article enumerates the many ways corn is used in unexpected ways. Most are not bad, by the way. It is a useful crop in many respects. As is the case with this soup. But to be perfectly honest, freshly harvested corn should be eaten as corn on the cob. The juicy sweetness of just-cooked corn – the white or yellow kernels bursting in your mouth – cannot be bettered. A plate of sliced, just-picked tomatoes and boiled and buttered Silver Queen sweetcorn was just about my favourite thing to eat as a child. I have not even tried to replicate this plate as an adult; I am certain it cannot be done here in Scotland. Not to my satisfaction anyway. Long, hot Tennessee summers spent at my grandparents spoiled me for many things, knock-out vegetables and fruits among them. I remember my sister and I helping my grandmother pick corn on her sprawling Tennessee farm. Just for ourselves, mind you. No child labour laws were contravened. I recall walking through the rustling canyons of twice-our-height rows of ripened ears of corn – the intense humidity, the occasional brush with creepy crawlies, the eagerness to get the fat ears into a boiling pot of water. If we were lucky it would go straight into a pot, buttered, then eaten without pause – or manners. A few kernels were always saved to shove onto our teeth to see what we would look like if we didn’t brush our teeth. If I grew corn this is what I would do: I would shuck the ears of their green, papery husks, rub away the tickly soft silks (brush the silks over a close relative and watch them squirm!) and drop them into a boiling pot of salted water for about four minutes (or barbecue as per this recipe). I would then drain then plop the ears back into the pan with a few pats of best butter or good olive oil. And, if no one was looking, I would sneak in some salt too. Not much beats freshly cooked corn on the cob. But a close second, especially now that the weather is cooling and we are all craving a bit of soup-action, is this smoky silky corn soup. Now, you know me, I like bold flavours (it says so in my wee bio to the right), but with this soup I have kept the spicing child-friendly so as to entice them into eating loads of vegetables without them knowing. Not only is there loads of sweetcorn, but sweet potatoes, carrots, celery, tomatoes, garlic and onion, too. I often add some chilli, or hot paprika with the smoked paprika, just to warm me and my slow metabolism up a bit more. But it is really lovely without the extra fillip of heat. And I know you don’t need convincing to eat corn, but just to remind you that this soup has bags of beta-carotene, and eye-protecting zeaxanthin and lutein. And a ridiculous amount of dietary fibre. Just don’t expect such health bonuses from HFCS-sweetened drinks. Of course, the best way to enjoy corn is boiled and slathered in butter but, once you have had your fill, why not make this subtly spiced, veg-packed soup? Tip: blend in a high-speed blender – like a Froothie, but other heavy-duty makes are good too – and you won’t need to sieve out the ‘bits,’ nor be tempted to add cream. High speed blending makes any soup like velvet and ever-so creamy. I give a ‘raw’ version below the main recipe. Garnish suggestions: chopped parsley, coriander, chopped tomatoes, corn kernels, and/or thick yogurt. 1. Stand each corncob – I break the cobs in half to make them more stable – on a chopping board and, holding a sharp, heavy knife at the top of the cob, scrape the kernels off the cob, extracting as much ‘milk’ and pulp as possible. Fresh corn and its pulp make the soup much creamier-textured than using tinned or frozen corn. But use either of these if fresh corn isn’t available. It will still taste great. 2. Heat the oil in a large saucepan over a low-medium heat. Add the onions and sauté until softened – about five minutes – stirring occasionally. Add the garlic, spices, carrots, sweet potato and celery. Stir and cook until the vegetables start to soften. Add the tomatoes, stock and corn. Bring the soup to a simmer and cook for about 20 minutes, or until the vegetables are cooked. 3. To blend, either carefully ladle the soup into a food processor or blender and blitz until smooth, or use a hand/immersion blender. Depending on how powerful your equipment is you may need to sieve the soup to remove the corn skins. Or you could cook, blend and sieve the corn separately and add to the cooked soup. Tip: you may want to keep back some corn kernels to add texture to the soup after blending. As above but ditch the oil, use 8 spring onions/scallions (if large ones, use a little less) instead of the onion, and use very warm stock or water, blending in a little at a time until you get the desired consistency and taste concentration. You may want to use more or less stock/water. The heat from a high speed blender will warm and lightly ‘cook’ the vegetables. Looks delicious! I’m not a big fan of celery though – would it matter too much if I left it out? Lovely images of you and sister picking corn as kids. My boy and I recently discovered a pick-your-own place ten mins away from us that grows corn, after years of living around here and I had no idea! I’m totally with you on succulent corn straight off the cob, nothing like it. Just gorgeous Kellie. Indeed, it is soup season and I’ve been enjoying it too, though I am already missing the summer temperatures. Thanks so much for submitting to NCR. Oh, that looks soooo good. Can’t wait for autumn to arrive so I can try it out! And thank you for mentioning my recipe by the way. Oh my gosh. Yum. This looks divine, but then all your stuff does. Love your story-telling lead-in. And you are too right about sweet corn — best straight off the cob. I’ve even eaten it raw in the yard! The best. Home-grown memories for sure. Dirty teeth. Hehe. We used to do that too. Cheers, Kellie. I’m sure things are crazy in Scotland, hopefully in a good way. PS — Did you know that FoodToGlow is the first of WP’s recommended food blogs? Made me smile, ’cause we already know how awesome you are. Shannon, you always leave the loveliest comments. I can’t believe we only know each other through the blogosphere (loved that word). You know just the perfect thing to say and have immaculate timing. Just sitting here missing my girl and up pops your comment. Thanks so much. And no, I didn’t know about my ‘status’ as first on the WP list. I am pretty sure it is a random thing but I will take anything i can get. Cheers for letting me know. 🙂 PS yes, I have eaten raw sweetcorn and it is great – but only just-picked. PS – we had only one small successful crop of corn — ate them all straight off the stalk! Then next one, raccoons found them all just days before we could enjoy. Drat. You know, I have heard that about raccoons and corn. They lay in wait and pounce just when the sugars have risen and the corn is at its ripest. Little blighters! I haven’t been over to yours in a while but will remedy that just now to see the hummingbird video. They used to hang out in my grandmother’s front garden sipping on all of her bird and bee friendly flowers. I miss that here in the UK. Best wishes with all of the schooling. I so admire you for that. What a tremendous commitment. I love the big, bold flavors in this soup! I LOVE the soapbox! I talk about non GMO so often, I think my friends are getting tired of hearing about it. Luckily we have lots of organic options. Love the soup recipe. Will have to tag for later when it’s a bit more fall like in California. PS: My sisters and I also did the corn on the teeth. Classic move. Must be a sister thing, the corn teeth years. 🙂 Yay about your soapboxing too. Rant-power! Although it is far from soup season here in hot and humid San Diego (I feel like I’m back in Florida :-), I’m pinning this one for later, as it looks divine! Glad you got on your soapbox today. My sentiments exactly! Thanks so much Lindsay. I knew vaguely about it but I did of course find the finer details on the Internet. Where else? Hi Kellie, love this soup, sounds delicious. The corn we were buying this year from the farmers market was so good. I agree with you about the engineered corn, stay away. Looks lovely and comforting, just what I feel like today. You should see the corn mum has grown this year, its amazing, that lovely StA sunshine has done the trick! Yeah, and I didnt know how beautiful the corn leaves are – all lovely and striped when the sun shines through them. What a beautiful soup making good use of all the corn that is flooding the shops at the moment. My kids adore corn, I can take it or leave it as a vegetable but because you have flavoured this soup with spices and I love soup of any description I would love this. I agree the Froothie eliminates the need for cream, it makes the smoothest soup ever! I will just hop up on this soap box with you Kelly, if you don’t mind. But the seasonal sweet corn of our summer months are certainly not to be missed and enjoyed in its pure form. 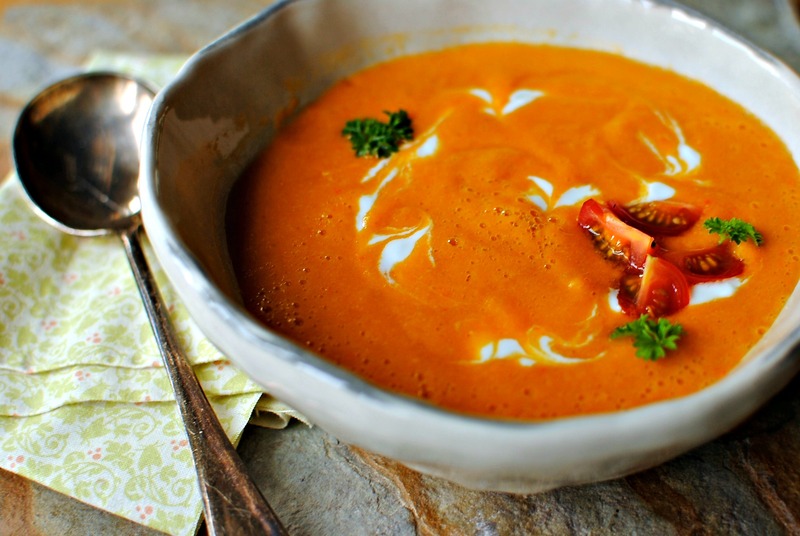 I’ve been enjoying it a lot in quinoa and salads too, but blended with sweet potato in this soup looks wonderful and seems like the perfect early fall dish. What a lovely soup! I too have been spoiled by the corn of my youth (this seems to be a common theme for you and I, maybe it’s an expat thing?) and though I buy farmer’s market corn from time to time, it just ain’t BC corn. I think the freshness and spice level of this soup seems just about perfect. Do you think it would work well with frozen corn when the fresh stuff is out of season? We do have a nostalgia thing about our food past, don’t we? In fact, my friend Niki (she commented earlier) said to me today that she can tell from my posts that I get homesick at this time of year. You would think that after being happily settled for nearly 26 years that I would be able to move on. You must be the same. You do the wistful post thing too. 😉 Oh, and I think this would be tasty with frozen corn, just not as creamy and ewith that certain something that only freshly shucked corn brings. This is sooooo beautiful! and comforting… loved the line: freshly harvested corn should be eaten as corn on the cob! I agree.. though this recipe is worth trying..
Also.. we here too love having fresh corns grilled on an open fire and then rubbed with lemon, salt and some red chilly powder..
🙂 Look forward to more comment.. I love it when you get on your soapbox – and learned some more scary facts from you. Need a bowl of comforting soup after that. Very yummy looking and soap box lecture was actually very informative. Now I just have to get my hubby to accept this recipe – he is a corn HATER — who knew such a person even existed? Good to hear you on your soapbox, it is important that we are all aware of these issues. Fabulous looking soup too! The best corn we eat in this house is straight from the garden, cooked within minutes of picking. But sadly (being a southern UK gal) the season and crop are far too short lived! still….. we are definitely heading into soup season now and this one looks like a diamond. Bookmarked!